Anyone who’s gone camping before knows the hassle of packing, tagging along all your equipment and utensils can be a bit of a bore. Remembering that hassle makes it easy to understand why glamping is becoming more and more popular and evermore glamorous. 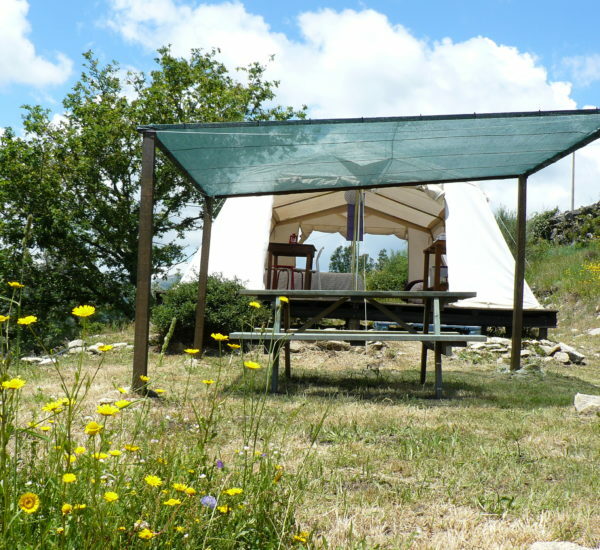 Stay in one of our sturdy furnished Farmers tents for your summer holiday. 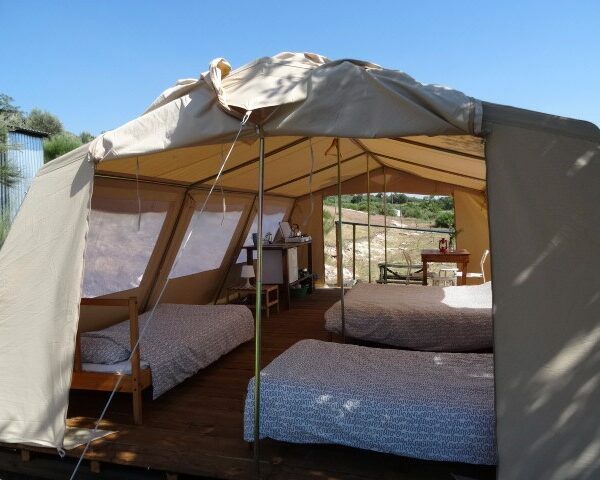 We at Quinta Rural have chosen to stick with the original concept of glamping: it’s still camping, but with the extras of real beds – made and all- a little kitchinette and lots of outdoor space. As all our accommodations, our safari-like tents come with amazing views, kind hosts (and guests), a well equiped bar, great meals, lots of tourist information ánd a complete donkey farm. Mounted from the 1st of June till the 30th of September. Panoramic views, the sound of popping seed, watching preybirds, relax under the ever so bright stars and sometimes even the milky way. 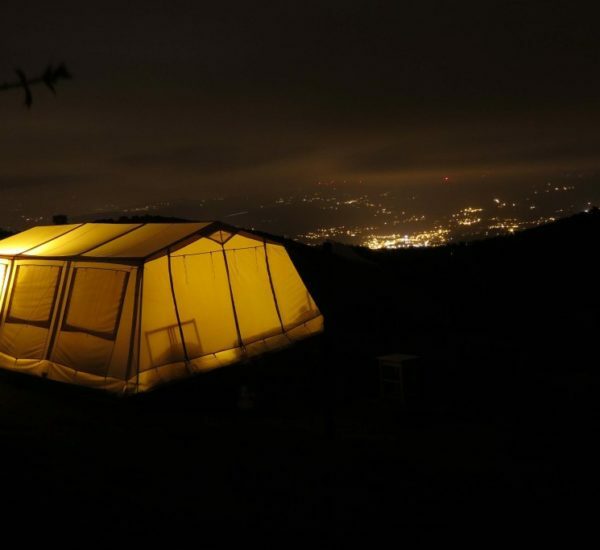 Our furnished tents bring you outdoor living at its best, paced to meet your personal style. 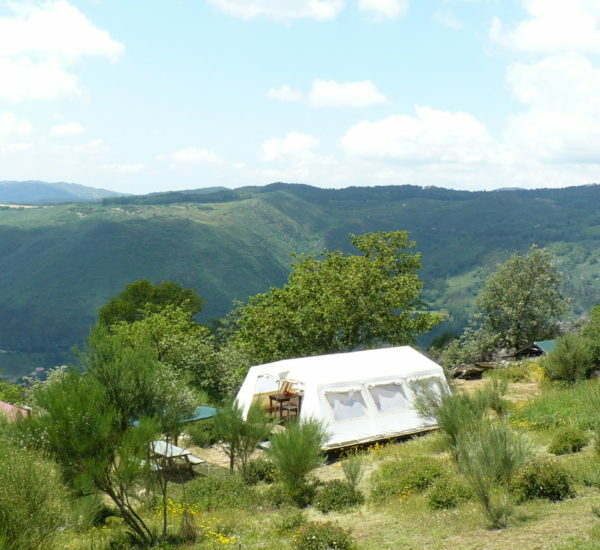 Spending your nights in a tent is the best way to truly enjoy the full richness of Northern Portugal’s nature. All you have to do is unpack your suitcase and enjoy. Price includes use of sanitary building with hot showers (no annoying shower coins), toilet paper, cooking gas, kitchen cloths, fresh bedlinnen, electricity, parking, use of all facilities, services and information. kitchinette with basic utensils, plates, cups etc. Whether or not we can call ourselves a ‘glamping’ (glamorous camping) is still open for discussion. It all depends on who’s asking. If you’re looking for artificial glamour, we’re not it. No golden door handles here, just the basics you need for a comfortable stay in close contact with nature. We, and luckily for us, our guests as well, think of luxury as a positive feeling. 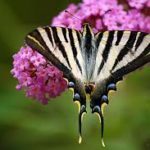 A warm welcome, a real sense of freedom, connecting with nature, spending quality time with friends and family, and undergo complete relaxation. Glamping or not, all of our furnished tents (and facilities) have been set up with your dream holiday in mind. Check out our facilities and services. Learn about our 350 years old Bar(n), the biological plunge pool, donkey hugging, great meals and barbecues, organised hikes & activities and more. In July & August, we have our chef on site who runs the kitchen offering dinners and BBQ 4 times a week. utilising as much homegrown and organic produce as possible from the garden and farm. The adjoining Reception/Lounge has a large shaded living area for dining plus a lawn and fire space for relaxing and enjoying the view. There is an attached bar and shop offering local and handmade products. Our toilet and shower area is beautifully designed out of wood and bamboo. It is subtly situated under a large cork tree, by the river where you can watch the sunset as you shower. All of our water comes from the site and hot water is solar generated. The toilets are dry compost toilets, emptied and cleaned daily. Your compost contributions are then used the following year to enrich the soil and feed the plants! We have a kids’ playground area with swings and slides, and hanging chairs in the trees. Amidst the gardens there are various shaded and comfy areas to sit in. We also have an ‘Open Farm’ where children can have the opportunity to have contact with and learn about the animals and nature. Children can stroke and feed the animals. There is a bar serving some alcoholic drinks, juices, smoothies. the calmer months of may, June & September are most suited.